Note the chassis serial number and part number. The chassis serial number and server part number are printed on a label affixed to the side of the chassis. See Remove the Motherboard Assembly..
(Sun SPARC Enterprise T5120 server) Remove all power supplies. Grasp the power supply handle and press the release latch. See the following figure. Slide the power supply out of the system. Disconnect the top cover interlock cable from the power distribution board. 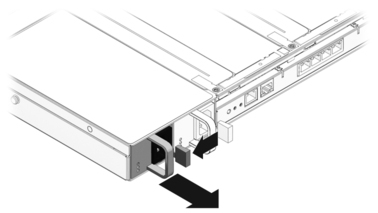 (Sun SPARC Enterprise T5220 server) Disconnect the ribbon cable between the power distribution board and the power supply backplane. See Panel 1 in the following figure. (SPARC Enterprise T5220 server) Remove the four No. 2 Phillips screws securing the power distribution board to the power supply backplane. See Panel 2 in the previous figure. Remove the No. 2 Phillips screw securing the power distribution board to the chassis. Grasp the bus bar and pull the power distribution board/bus bar assembly to the left, away from the paddle card. Lift the power distribution board/bus bar assembly up and out of the system. 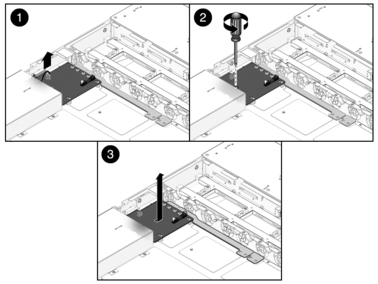 Place the power distribution board/bus bar assembly on an antistatic mat.